RAWALPINDI, Nov 28 (APP): Pakistan on Wednesday successfully conducted the training launch of Medium Range Ballistic Missile Hatf V (Ghauri). The launch was conducted by a Strategic Missile Group of the Army Strategic Force Command on the culmination of a field training exercise that was aimed at testing the operational readiness of the Army Strategic Force Command. According to ISPR here, Ghauri ballistic missile is a liquid fuel missile which can carry both conventional and nuclear warheads over a distance of 1300 kms. Why Is Pakistan’s Latest Nuclear MissileTest Different? Lo ji, now the monkeys in Islamabad have access to the red button custom installed in their mansions. We are doomed. It's probably out of date. No, It's just Pakistani journalism at its best!!!!!!!!!!!!! A spokesman of ISPR has said that the Hatf V (Ghauri) missile test conducted on Wednesday was a complete success. The missile during its flight remained within the designated flight path and corridor. The metal parts found in a remote area of Dadu, as reported in media today, were part of the motor body, which separated from the missile as planned, well within the safety corridor. It was ensured that at no point, would human life or property be at risk. There is no cause for alarm or concern, the spokesman concluded. KARACHI: The mysterious metallic objects, which fell from the sky baffling villagers in Dadu late Wednesday night, were parts of Pakistan’s Hatf V Ghauri missile, a spokesman for the Inter-Services Public Relations (ISPR) said on Friday. “The metal parts found in a remote area of Dadu, as reported in media today, were part of the motor body, which separated from the missile as planned, well within the safety corridor,” said a statement by the ISPR. “It was ensured that at no point, would human life or property be at risk. There is no cause for alarm or concern,” the spokesman concluded. 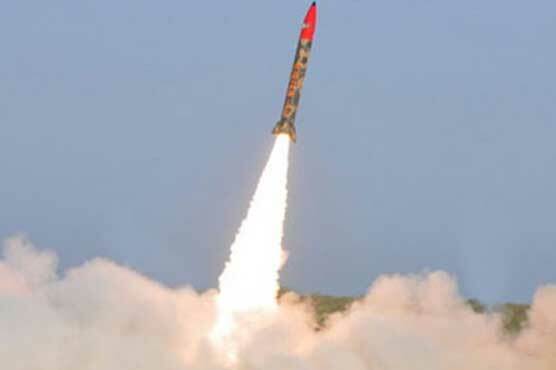 Pakistan conducted a test of the mid-range nuclear capable ballistic missile on Wednesday. The liquid-fuelled missile, capable of carrying both conventional as well as nuclear payload, has a range of 1300 kilometres. Fear and bewilderment overtook some parts of Dadu district after the mysterious objects fell on a number of villages late on Wednesday, the Dawn newspaper had reported. The biggest fragment weighing 187 kilograms fell on a ground in Allah Jurio Lund village, 30 kilometres from Dadu. Other pieces fell on Pir Mashaikh, Shehak Rodnani and Khandhani villages. There were no injuries or damage to property. Military authorities were reported to have taken possession of the “heavy pieces of engine and other metallic objects, believed to be splinters of a satellite or missile”. "At this point after 110 seconds of powered flight the warhead is then separated from the booster stage to fly on a re-entry trajectory that remains stable to its target." Looks like they were pieces of the booster stage of the rocket which was separated from the warhead before re-entry. Its all part of the design of the missile. KARACHI: The mysterious metallic objects, which fell from the sky baffling villagers in Dadu late Wednesday night, were parts of Pakistan&rsquo;s Hatf V Ghauri missile, a spokesman for the Inter-Services Public Relations (ISPR) said on Friday. &ldquo;The metal parts found in a remote area of Dadu, as reported in media today. were part of the motor body, which separated from the missile as planned, well within the safety corridor,&rdquo; said a statement by the ISPR. &ldquo;It was ensured that at no point, would human life or property be at risk. There is no cause for alarm or concern,&rdquo; the spokesman concluded. Military authorities were reported to have taken possession of the &ldquo;heavy pieces of engine and other metallic objects, believed to be splinters of a satellite or missile&rdquo;. It wasn't the warhead, it was the booster stage body that separates. Isnt it pathetic that we did not map the flight path to avoid the parts falling close to populated areas? on side note I wonder if the missile has MIRV capability. It's not a 100% avoidable. ISLAMABAD — Despite the official announcement that the Nov. 28 test of the Ghauri/Hatf V (Vengeance V) ballistic missile was successful, reports in the local media indicate the missile in fact disintegrated. The reports were accompanied by images of the missile debris that fell in and around villages in the district of Dadu in the southern province of Sind. They were reportedly quickly secured by the police and then removed by the military. One piece of the debris was clearly marked “‘Flight Control Computer.’’ Other images show a mass of wires among tubular metal pieces. “The missile during its flight remained within the designated flight path and corridor. The metal parts found in a remote area of Dadu, as reported in media today, were part of the motor body, which separated from the missile as planned, well within the safety corridor,” it stated. The missile may have originated from the Tilla missile test-firing range near the Punjabi city of Jhelum. Its trajectory seems to indicate it was heading for impact in Balochistan province, (possibly the Sonmiani firing range), or the Arabian Sea. Analyst Haris Khan of the Pakistan Military Consortium think tank does not accept the military’s version of events. “It seems there was some kind of failure here,” he said. “I’m not sure if the Ghauri has a separating warhead, but it is possible. However, the missile body clearly disintegrated and fell over a wide area. The missile was a single-stage weapon. This is unusual. The body should have stayed intact even if the warhead did separate,” he added. He does not see any reason why disintegration would be planned. “This has never reported to have happened in any previous missile test”, he said. If this is indeed a failure, Khan says it would mark the third known incident of this kind involving the Ghauri since it was purchased from North Korea by disgraced metallurgist and former administrative head of the then-Khan Research Laboratories, Abdul Qadir Khan. The first test in 1998 led to the missile breaking up, and in a later test the Ghauri is known to have fallen in Iranian territory, leading to a diplomatic protest from Tehran. Khan says because the design was outdated when purchased, the considerable modernization work done by the National Engineering and Scientific Commission and the National Defence Complex may not have been wholly effective. Ultimately, he says the Ghauri missile system needs to be retired. Debris falling does not necessarily mean that the test failed. For a proper conclusion to it, you need to know exact time of flight, palce of launch and place of delivery, the flight path, the altitude it reached, the expected parameters for the separation (altitude, speed, place etc), and then some other things. Separated parts always fall from above, it could be that this one got noticed, or maybe it could indeed be a failure. Looks like we all will just have to guess, just with the Saab 2000's! Hatf II (Abdali) carries nuclear as well as conventional warheads with high accuracy. Pakistan successfully test-fired the short range surface-to-surface ballistic missile Hatf II (Abdali)‚ as part of the process of validation of land based ballistic missile systems. Hatf II (Abdali) with a range of 180 km‚ carries nuclear as well as conventional warheads with high accuracy. The weapon system with its varied maneuverability options provides an operational level capability to Pakistan's strategic forces. The test was witnessed by Chairman Joint Chiefs of Staff Committee‚ General Khalid Shameem Wynne‚ Director General Strategic Plans Division Lieutenant General (Retd) Khalid Ahmed Kidwai‚ Commander Army Strategic forces Command‚ Lieutenant General Tariq Nadeem Gilani‚ senior officers from the strategic forces and scientists and engineers of strategic organizations. President Zardari and Prime Minister Ashraf have congratulated the scientists and engineers on this outstanding achievement which consolidates Pakistan's deterrence capability both at the operational and strategic levels. Everytime news about a missile test is conducted, us members here on PDF tend to open different threads. Therefore could i kidnly ask you to collect every thread regarding HATF/GHAURI/BABUR, nuclear/missile tests, discussions, etc etc into one single pinned thread for each segment?? Pakistan successfully test-fired the short range surface-to-surface ballistic missile Hatf II (Abdali)&sbquo; as part of the process of validation of land based ballistic missile systems. Hatf II (Abdali) with a range of 180 km&sbquo; carries nuclear as well as conventional warheads with high accuracy. The weapon system with its varied maneuverability options provides an operational level capability to Pakistan's strategic forces. The test was witnessed by Chairman Joint Chiefs of Staff Committee&sbquo; General Khalid Shameem Wynne&sbquo; Director General Strategic Plans Division Lieutenant General (Retd) Khalid Ahmed Kidwai&sbquo; Commander Army Strategic forces Command&sbquo; Lieutenant General Tariq Nadeem Gilani&sbquo; senior officers from the strategic forces and scientists and engineers of strategic organizations. Ma'Shah'Allah, Pakistan's second test in a week.